Notification of the passing of retired pilot Alexander McQuary ‘Bill’ Banks, age 90. Born February 5, 1923 and peacefully passed away July 12, 2013 at home. Bill is survived by his wife of 36 years, Lucy; his son, Robert Banks & wife Sandy; daughters, Roberta Banks, Marcia Banks and Shelley LeTendre. "Grandpa Bill" has four grandchildren, Brian Banks, Brittany Banks, Bradley Banks and Melita Jampol & husband Thaddeus. Zoe Jampol is his great-granddaughter. He is also survived by brother-in-law, Joe Kraws. During Bill's extended stay in the hospital, he spent many hours remembering those people whose paths he felt so fortunate to have crossed. 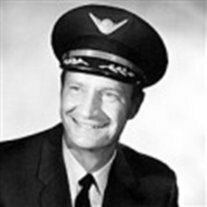 The timeline extended from his days as a Navy Lieutenant, to the beginning of his airline career in 1948 with Wisconsin Central Airlines (later North Central Airlines then Republic Airlines and Northwest Airlines). He also had fond remembrances of business associates through his ownership of the W.R. Ringheim Company, Inc., his racquetball buddies at the Decathlon Athletic Club, and golfing friends at the Minneapolis Golf Club. Bill's wishes are being honored with a private funeral, and burial at Ft. Snelling Cemetery. Please take a moment to remember your special "Billyism," and if you wish, you may send memorials to the Animal Care Center of St. John, PO Box 429, St. John, USVI 00831. Alexander McQuary "Bill" Banks, a U.S. Navy aviator during World War II, was the last surviving pilot of the original 16 who began flying for Wisconsin Central Airlines, an ancestor to three Twin Cities-based carriers. Banks, who was 90 and had resided for many years in Bloomington, died July 12, after an extended hospital stay. In recent years, he and his wife, Lucy, split their residence between St. John, Virgin Islands, and Eden Prairie. Banks was born and raised in Chicago, attended school there and enlisted in the Navy two months after the Dec. 7, 1941, Pearl Harbor attack. After his flight training, he first served as a flight instructor in Texas, then in a divebombing squadron. He later piloted military transport planes in the Admiralty Islands and the Philippines. In 1948, after leaving the Navy, he took a job with start-up regional airline Wisconsin Central, based in Madison, Wis. Banks was chosen — by drawing straws — as its senior captain, said Matt Ruper, who later served as a pilot for the airline. Over his long career, Banks witnessed the airline industry's evolution from propellers to jets and the gradual consolidation of small, regional carriers into major U.S. airlines. Wisconsin Central initially flew twin-propeller, nine-seat Lockheed 10As on routes in Wisconsin and Minnesota, Ruper said. The planes were so small that they had no flight attendants, so the pilot did double duty assisting passengers to their seats. Some of the planes were less than perfectly maintained. Once, Banks touched down at the Milwaukee airport when the sole passenger tapped him on the shoulder to say, "I hate to bother you, sir, but the cabin door is missing." After parking the plane, Banks and the co-pilot retrieved the door from the runway, wired it on and resumed the flight, according to Robert J. Serling's book, "Ceiling Unlimited: The Story of North Central Airlines." Wisconsin Central, with its famous logo of the flying duck on the planes' tails, later merged and became North Central Airlines, then Republic Airlines, which was taken over by Northwest Airlines, itself eventually acquired by Atlanta-based Delta Air Lines. Banks flew DC-9 and Boeing 727 jets during his career, and retired in 1982. He had 32,588 flying hours. His widow, Lucy, who met him when she worked as a flight attendant, said he had an unblemished flying record. "He always said, 'I never hurt anybody or dented any metal,' '' she said. In 1980, Banks and a partner purchased commercial hardware distributor W.R. Ringheim Co. of St. Louis Park, and he eventually became sole owner until selling the business in 2010. The company once employed up to 10 people, but it later scaled back its business to warehousing and employed about half that, said Larry Hendricks, the company's vice president. Banks, whose first wife, Ruth, preceded him in death, is survived by their three children, Robert of Apple Valley, Roberta of San Diego and Marcia of Phoenix; stepdaughter Shelley LeTendre of St. John, Virgin Islands; four grandchildren, and a great-grandchild.